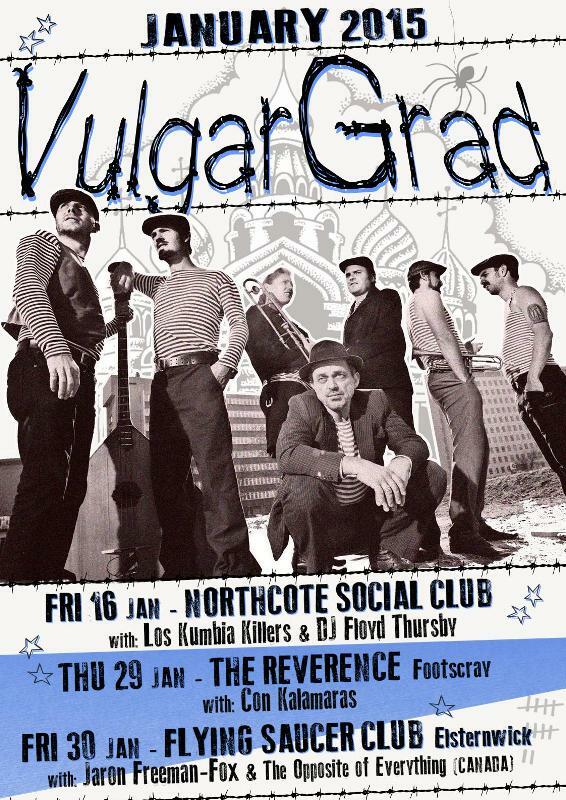 2015 kicks off with 3 huge gigs for VulgarGrad in Melbourne, but – as usual – we can’t promise many more for a while. Get in while you can! 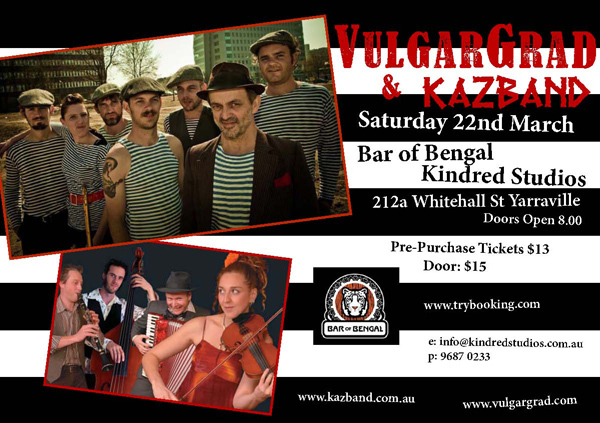 After 8 years, VulgarGrad’s first gig in Melbourne’s West! With the mighty Kazband. Buy tickets here. With Tek Tek, Empat Lima and DJ FLoyd Thursby! Between flights arriving from Warsaw and those departing for Moscow, there are very few opportunities these days for VulgarGrad gigs in Melbourne. What do we do when one of those opportunities is on a Tuesday night – not the most preferred of gig nights? We do it at everybody’s favourite cosy-but-raucous Northcote institution, OpenStudio Bar. Can you believe it’s our first gig there ever, after all these years? Come down and make it a memorable one. Your last chance for the year! RESURRECT YOURSELF BEFORE YOU WRECK YOURSELF this Easter Sunday with the healing power of VulgarGrad, supported by Mikelangelo and Saint Clare. Note that it’s one of the NSC’s awesome matinee shows, so the doors open at 2pm and you should be home in time for whatever it is you choose to do on Sunday evenings. Also, the next day is a public holiday, so you can drink as much vodka as you like, even on a Sunday afternoon. Click the pic for details. In a month that sees VG play north of the Murray and east of the Tasman, why not south of the Yarra, too? On Sat 30 March, VulgarGrad plays at the Flying Saucer Club in Elsternwick, supported by Melbourne’s very own princess of Soviet retro pop, Katia Pshenichner. We’ll also be featuring some very special guests in the horn section. Book here. After stealing not just the show, but the whole WOMADelaide Festival in 2010, VulgarGrad are now skipping across the Tasman to threaten the Kiwis with grievous musical harm. Catch them at WOMAD NZ, Taranaki on 15 and 16 March.